Fifteen people have perished in a grisly accident after a Madina Nairobi-bound bus from Mandera rammed a stalled lorry in Matuu, Machakos county. The Injured were rushed to the Matuu Level Four hospital, Yatta Police boss Njoroge Karanja confirmed. The stalled lorry crew had not put up lifesavers to warn other road users which has been blamed as a key cause of the 5AM accident. Among those who perished on the spot were ten men, two women and a child. 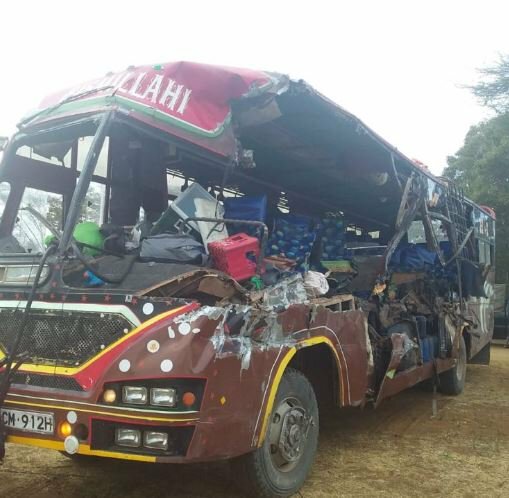 A video making rounds on social media shows the extensive damage to the 68-people capacity bus of registration KCM 912 H.
The post 15 perish in deadly bus & lorry crash at Matuu appeared first on Kenya Today.